Expand to 395 photos (70 cars) found with model of "GT-350"
(from page 31 of the 1965 Collection) This is a rare one. It's a real Wimbledon White 1965 Mustang Shelby GT-350. Two things make this shot rare. Only 521 of these were built in 1965. And it's being shown in the rain! I spotted this at the 2009 All Ford show at Uftring Ford in East Peoria, Illinois. (from page 35 of the 1965 Collection) Ford promotional, black and white photo of a truck load of 1965 Shelby GT350's all loaded up at the Shelby plant ready for delivery. (from page 37 of the 1965 Collection) Although technically serial number 003, this Shelby Ford Mustang GT350 was the first unit completed and was used in publicity photos for the upcoming line of customized vehicles. Serial numbers 001 and 002 were completed later and were race versions. In 1979, this car was restored as a race car and raced. 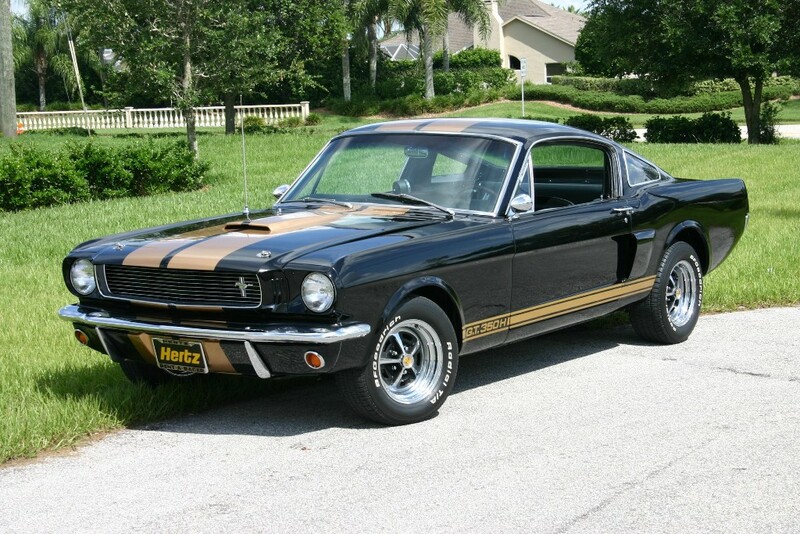 It was later discovered that it was originally built as the first street GT350. It will be restored to its original condition. We photographed this amazing car at the 2010 Mustang Club of America Grand Nationals car show held in Bellevue, Washington; and was our Attitude Of The Week for the week starting February 27th, 2011. (from page 39 of the 1965 Collection) These are two of the three 1965 Mustang Shelby GT-350 prototypes. The front one is a street version - serial number SFM5S003. The other is one of two race prototype versions (SFM5R003 GT-350R Prototype). These started as white K-code (HiPo 271ho 289ci) 1965 Mustang fastbacks. Where is the third one? It exists and is in a private collection. (from page 39 of the 1965 Collection) This is a rare 1965 Mustang Shelby GT-350 Drag Unit fastback. It is one of four originally created by Shelby. It has a 289ci 306hp engine and a 4-speed manual transmission. Other features included Gabriel Silver Eagle rear shocks, Cure-Ride up-lock front shocks, 9x14 tires on 5x14 wheels, 5.13 rear, engine torque strap, Belanger drag headers, NHRA-approved Cobra scattershield, Hurst Competition-Plus shifter, driveshaft safety loop, and AFX rear traction bars. (from page 39 of the 1965 Collection) This Wimbledon White 1965 Mustang Shelby GT-350R fastback was built for racing. It was not a street-legal car. This car was listed on Craigslist back in 2008. The photos are from the listing. At the time, it was the most expensive car ever listed on Craigslist. The listing said, "Car #530 one of only 35 Produced (1 of 25 still remaining). These "R" code GT 350's were unique in that they represented the first time an American auto manufacturer offered a strictly-for-racing model that was SCCA B/Production compliant. This vehicle was shipped to Lima Peru on 7/29/66 and raced extensively on the South American circuit. It was the South American Champion in it's class and the Peruvian National Champion in the late 60's. Brought back to the US in 1984, I have a copy of the original Shelby American Invoice Referring to SFM 5R530 as a 1966 GT 350 Race dated June 28, 1966. PLEASE NOTE: According to the Illustrated Shelby Buyers Guide by Lamm & Nicaise 1992 page 60 - "That last batch incidentally is often referred to as the 1966 R-models; they were assembled after regular 1965 GT350 production had shut down" "They were given serial numbers , though, and titled as 1965 models." # 5R530 is one of these vehicles." (from page 38 of the 1966 Collection) Here is one of the Hertz Shelby GT500H advertisements from 1966. Yes, that is a blurry image. The GT350 is cook'n. It says, "There are only 1000 of these for rend in the entire world. Hertz has them all. It's the Shelby G.T.350-H. Only Hertz rents it. Cobra engine. Disc brakes. High speed wheels and tires. Stick shift or automatic. Rally stripes. High performance shocks. Torque controlled rear axle. The whole load. Why a rent-a-car with all this performance? We could have gotten a fleet of high-powered pseudo-sports-cars. But we figured you'd want to try a champion. Not just another imitation. So we got the one car that holds the Sports Car Club of America National Championship. And you can rent this 4-seater G.T.350-H from Hertz in most cities for a day. Or longer. But only from Hertz. Two stipulations. You have to be at least 25 years old. And you have to hurry. (It's all on a first-come-first-serve basis.) So make your reservation today. One local phone call reserves your car here. Or just about anywhere in the country. Call the only rent-a-car company that offers you a championship G.T.350-H."
(from page 38 of the 1966 Collection) Hertz presents the G.T. 350-H This is the cover of one of the original 1966 Hertz brochures advertising the Mustang Shelby GT350H. It says, Shelby designed, cobra bred, Ford powered, and rented exclusively by Hertz.